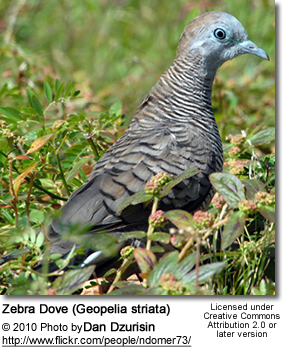 The Zebra Dove (Geopelia striata), also known as Barred Ground Dove, is a bird of the dove family Columbidae, native to South-east Asia. Their call is a series of soft, staccato cooing notes. 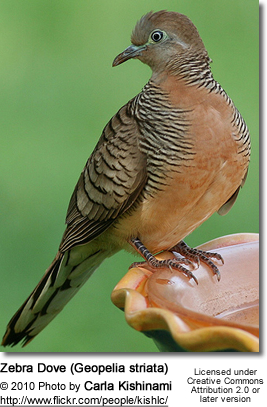 In Thailand and Indonesia, the birds are popular as pets because of their calls and cooing competitions are held to find the bird with the best voice. 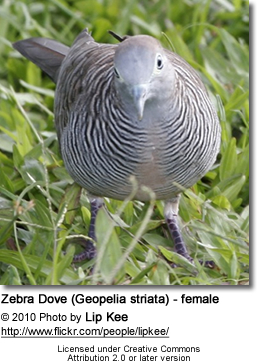 The Zebra Dove feeds on small grass and weed seeds. They will also eat insects and other small invertebrates. 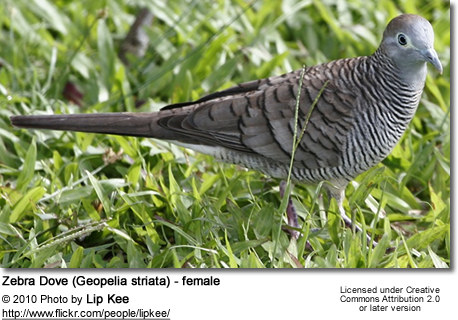 They prefer to forage on bare ground, short grass or on roads, scurrying about with rodent-like movement. 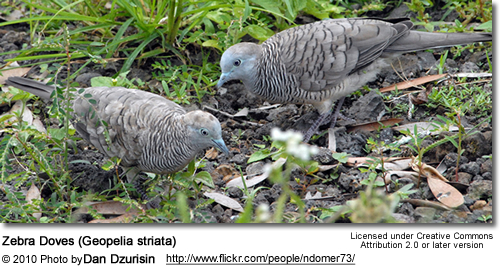 Unlike other doves, they forage alone, or in pairs. Their coloration camouflages them wonderfully against the ground. In Hawaii and the Seychelles they come to hotels, restaurants, and even people's houses to feed on crumbs and pieces of bread around outdoor tables. 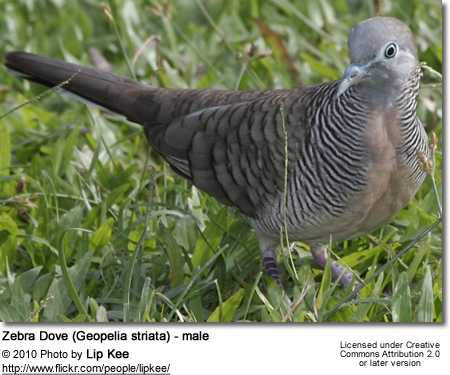 In its native range the breeding season is from September to June. 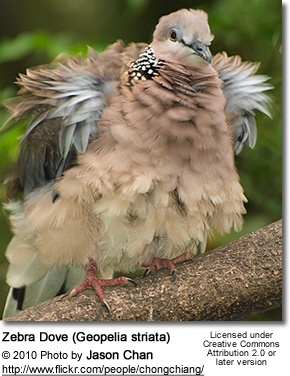 The males perform a courtship display where they bow while raising and spreading the tail. 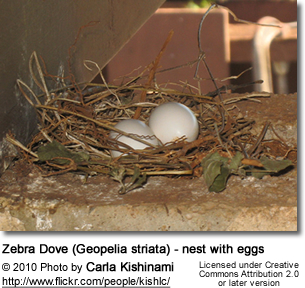 The nest is a simple platform of leaves and grass blades. 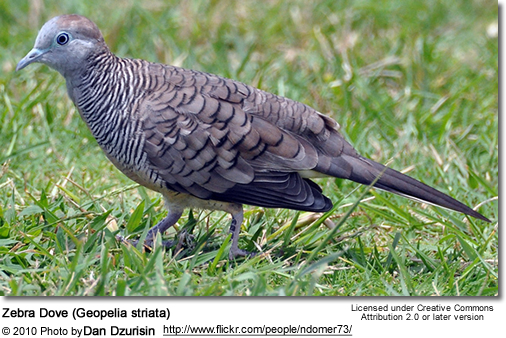 It is built in a bush or tree or sometimes on the ground. One or two white eggs are laid and are incubated by both parents for 13 to 18 days. 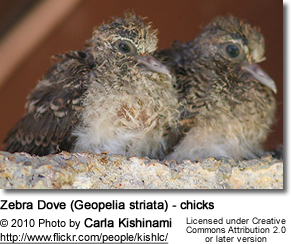 The young leave the nest within two weeks and can fly well after three weeks.